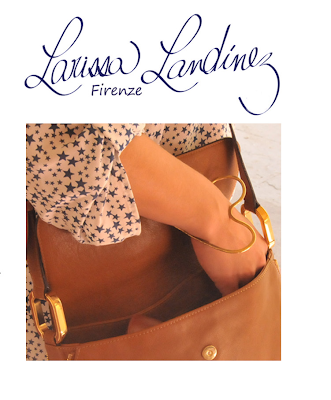 Florence based Larissa Landinez is deeply passionate about handcrafted and traditional jewelry and the most important tool to her her technique is her passion and love for jewelry making. She designed and created a delicate and loving heart bracelet about a year ago for valentines which quickly became one of her statement pieces which represents for her. "The love and sweetness that we should always carry in our hearts". The first heart bracelet was made in brass then producing it in different materials such as 925 silver and 18kt gold. Already garnering quite the celebrity following. US MARIE CLAIRE magazines tyle and accesories director TAYLOR THOMAS HILL went coocoo over these bangles, snapping one up as soon as she saw them and VOGUES.COM"S fashion editor JESSICA BUMPUS define the bracelet as quirky and different being attracted to it. Erin Wylie, Martha Stewart weddings defined it as a perfect gift to give to your bridesmaid's on the wedding day, with engrave date wich makes it quite unique and memorable. Simple as a heart with special thought and careful design to fit the wrist, it comes in different sizes and it's absoluteley hand crafted.